We cannot celebrate Christopher Columbus because he was a criminal who started five centuries of death, robbery, racism and imperialism. We should not glorify and thus justify Columbus’ horrendous legacy of crimes against the whole humanity, because we will be justifying the continuous abuses caused by colonialism and racism. Christopher Columbus -like most of the European invaders of the world- was a despicable man who believed in White supremacy, he was evil and sold humans as a slave trader in Africa and the Americas. He was a religious fanatic who believed in the supremacy of European people, just because his God mandated it to be that way. 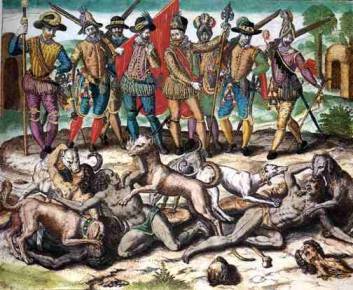 We will not celebrate Columbus because he started and promoted the biggest holocaust in human history, the genocide of Indigenous peoples in the Americas -which was justified by a hateful religion and by a mentality of European supremacy and imperialism. These VIDEOS show part of an anti-Columbus protest held in Washington, District of Columbia, this past October 10th, 2011 in the Columbus memorial at Union Station. We should never celebrate Columbus of any of the men who committed such horrendous mistakes made in the past. We need to learn from those crimes, because the first contact of Europeans and Natives peoples did not have to be that way. In fact, the arrival of Colon was not the first time White immigrants arrived to this land. It was the first time they came hungry for gold, food and blood. These explorers [invaders], and countless others that followed them, encountered indigenous peoples that had lived in the Western hemisphere for tens of thousands of years. On this day, we also remember the tragic hardships these communities endured [genocide, slavery, forced displacement, abuses that still happening today]. We honor their countless and ongoing contributions to our Nation, and we recommit to strengthening the tribal communities that continue to enrich the fabric of American life. This declaration was another symbolic gesture of hypocrisy, as millions of Indigenous migrants from the South are being incarcerated and deported by the U.S. government. Most embarrassing, the capitol city of this country has a sports team labeled “Redskins“, among hundreds of other teams across the country named Chiefs, Redmen, Indians, Savages, Braves, etc. The fate of Natives peoples changed since 1492 and turned our lives into nightmares that continue today. Native peoples are still being killed today while the high rates of poverty, unemployment, suicide, drug addictions, children mortality, prison population, human-caused diseases, labor abuses and mass displacement among the Native communities of the U.S. and the rest of the Americas, are outrageous and inexcusable. This is why we protest Columbus and his legacy. We do not ask for revenge. We want understanding of humanity of why we are diverse and that we are related to each other. We will not move on beyond the painful legacy of colonialism, unless we recognize our mistakes, we apologize and commit to prevent genocide to ever happen again. We will never celebrate or be silent about it . Because if we celebrate Columbus, we justify death, wars, racist hatred and crimes against humanity in the name of false values — it is happening now in Congo, Sudan, Libya, Palestine and other occupied regions of the planet. We protested this week, do your part. Re-educate yourself and those around you. I’ve never been a big fan of Christopher Columbus, the man who “discovered” the Bahamas. Carlos is dead-on about racism and genocide, as European arrival wiped-out millions of indigenous peoples within a short span of time. We shouldn’t forgot that in 1492, Spain had just completed expelling nearly every Jew and Muslim from its portion of the Iberian Penninsula, and was actively involved in torturing and murdering thousands via the Inquisition. These were not “nice” people who arrived in the Americas. Keep spreading the real message, Carlos.